Manish Buildwell Presents “Manish Gallexie 91” is new commercial project offered high street retail shops, food court and service apartments. 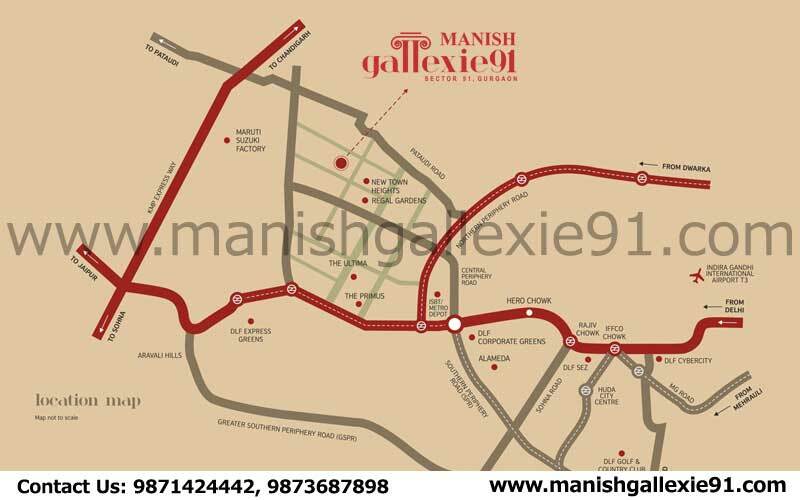 Manish Gallexie 91 located in Sector 91 prime location of gurgaon attached with Dlf Galleria and next New Town Heights. Manish Gallexie 91 a multi faceted commercial space with spacious shops, office spaces, retail stores, multi cuisines restaurants, Multiplex and lifestyle stores you are on the doorstep of controlling a successful enterprise. Manish Gallexie 91 Gurgaon in true sense, a commercial masterpiece. It is a location which gives your commerce a unique frontage and more space to plan your activities with special features like an impressive entrance, 100% power back up, air-conditioned with energy efficient chillers, 24 hrs security surveillance, modern fire detection, suppression systems with sprinklers, fire/smoke detectors meeting all NBC norms, high speed elevators, seismic design complaint as per zone and glass facades make Manish Gallexie 91. Strategically located on 75mtr. IMT Road. Multi-level car parking, additional space left for stack-parking.